Today's installment of Prime Minister's Questions (December 13) was dominated by questions about housing, with Jeremy Corbyn hammering Theresa May on the issue. But was Labour's attack really justified? Independent fact-checking charity Full Fact has crunched to the numbers and here is their objective appraisal of the issue. You can find out more about Full Fact by visiting their website here. There’s a legal duty for the state to help people who are homeless or threatened with homelessness. Councils are responsible for this in England, Wales and Scotland, while Northern Ireland has a single organisation responsible for housing. Each country has a slightly different approach, but in general the authorities must find somewhere for a person to live if: they meet the immigration status requirements, are accepted as homeless, are in a ‘priority need’ category (except in Scotland), and haven’t become homeless intentionally (optional for councils in Wales). Claims about homelessness often refer just to England, rather than the whole of the UK. We've focused on that here, although there are separate figures for Northern Ireland, Scotland and Wales. Not everyone who becomes homeless is entitled to be housed. In England councils only have a duty to find somewhere for a person to live if they have a ‘priority need’. This includes families with children, people in an emergency after a flood or fire, or who are “vulnerable” for various other reasons. In addition, they must not have deliberately done or failed to do anything that caused them to become homeless. Around 59,000 households were accepted by councils as entitled to be housed in 2016/17. This number has been rising since 2009/10, and is up by almost 50% since 2009/10. However, it’s 56% below the level of 2003/04, when 135,000 households were accepted. These figures don’t include those who were assessed as homeless but not in priority need, or homeless but intentionally so. There are around 20,000 cases found homeless but not considered in priority need each year, or around one in six of all decisions. Around 8% of cases, or 10,000 households, are homeless and in need but considered to be intentionally so. If councils decide someone is not in priority need they have to offer advice and help with finding somewhere to live, but not accommodation. If they decide someone is intentionally homeless and in priority need, they only have to provide short-term accommodation. A new law – the Homelessness Reduction Act 2017 – is set to come into force next year. 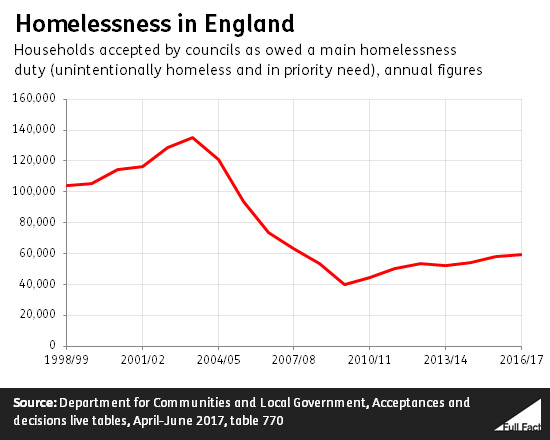 Amongst other things it put new duties on local authorities in England to prevent and relieve homelessness for everyone, including people who don’t count as ‘priority need’. The Government has promised £73 million to local authorities to meet the new requirements. The code of guidance for local authorities is currently under consultation. People can be put in temporary accommodation while their claim is investigated or they are waiting for somewhere suitable. Temporary accommodation can include B&Bs, hostels, council housing and private rentals. In England 63% of households who accepted an offer of housing in the first quarter of 2017 were given temporary accommodation. 84% of them were placed in “self-contained accommodation”, such as council or private rentals. The rest were in B&B or hostel-style accommodation. 70% of English households in temporary accommodation were in London. At the end of June 2017, 78,000 households were in temporary accommodation. This is 7% higher than the same time in 2016. The number has been increasing steadily since 2011, but is still well under the peak of 101,000 in 2004. Almost one in 10 households in temporary accommodation were in bed and breakfasts in early 2017. 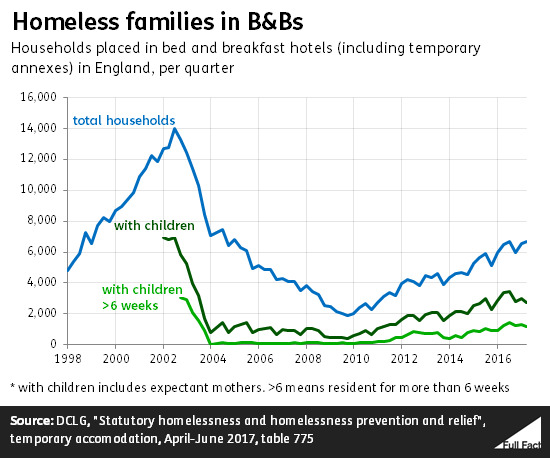 Governments have been concerned about families with children being placed in B&Bs since the early 2000s. Since April 2004, the law has said that families with children should not be housed in B&Bs except in an emergency, and then only for six weeks. 2,700 families with children were in B&Bs in the second quarter of 2017. This has been increasing since 2011, but is below the peak of 7,000 in 2002. People who are legally homeless are “rarely” on the streets, according to the Department for Communities and Local Government. We don’t have definitive statistics for how many people are sleeping rough. In England the number of people sleeping rough is a snapshot taken in autumn each year. Councils count or estimate the number of people sleeping rough in their area. Most authorities talk to local agencies and give an estimate. So the figures we’re using here are only very rough estimates. Last year, 4,100 people were estimated to be sleeping rough in England. This is 16% higher than in 2015, and more than double the estimate of 1,800 for 2010 (the earliest comparable data). In London a much more detailed database is kept. CHAIN records people found sleeping rough by outreach teams. 8,100 people were seen sleeping rough at some point in 2016/17, slightly more than in the previous year. A parliamentary committee investigating homelessness has recommended that a system like CHAIN be used in more areas.